Personal Website for customers and friends to refer their friends to learn about you! E-Mail newsletter professionally written and graphic-designed. 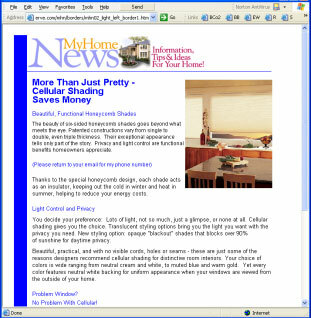 Each month your customers will receive their personally addressed edition of "MyHome News" sent under YOUR business name. Your quality and professionalism are reflected by your good choice of marketing messages. Your monthly fee includes hosting, technical support; E-mail Newsletter writing, editing, graphics and layout. 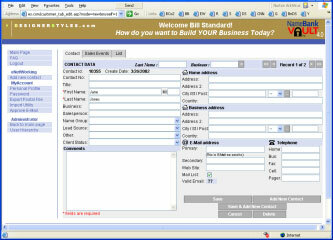 eNewsletter is sent personally addressed to customers, under YOUR business name. No added costs - ever! With your own professional website you can increase referral sales. Tell your friends, customers, and networking associates where to find you on the web - and ask them to tell THEIR friends! When they read about your products and professionalism it will give you credibility. 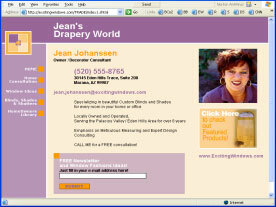 Customers will like what they see on your website and be encouraged customers to call. Today, every REAL business has a website. Your best customers - those with money, and who appreciate quality and service - use the web most of all. Latest information indicates that over 90% of homeowners over $75,000 income use the web and email consistently. Each time you set an appointment, invite your customer to visit your website before you arrive. Tell her she will find good ideas and possibly see products or treatments she likes. She will be impressed knowing you are an expert. When she greets you at the door she will recognize you from your photo, and welcome you as a friend. Because she knows the quality work and products you offer, she will be more disposed to buy from you. Every month your customers, friends, and prospects, will receive "MyHome News", professionally written and graphically designed. Customers will thank you for decorating tips and ideas. When they need window covering for themselves they will remember your great service.... and you can be sure they will remember you to a friend. Project your quality image and professionalism! You will receive an online database you can access from any Internet computer - office, home, friend, customer, or even on vacation at an Internet Cafe. Keep names for reference and list E-mail addresses. Every E-mail will be personally addressed to customers and friends. Want a mailing list? It's easy. Just a few clicks of your mouse button and it is on the way. Now you will be better organized and have information at your fingertips. 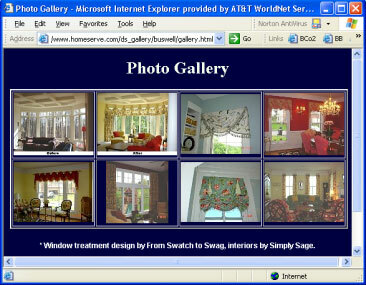 Would you like a customer gallery to show your work? Nothing could be easier. As an option, we will build your gallery for about $75. It's a one time cost. Then we link it to your website to make it easy for viewers to see. Each photo is clickable to enlarge. There is no better way to show off your work and pre-sell your customer! Your customers are proud to be viewed world wide. You are proud to show them!